Everything went better than unexpected. Thank you so much for the lovely update. 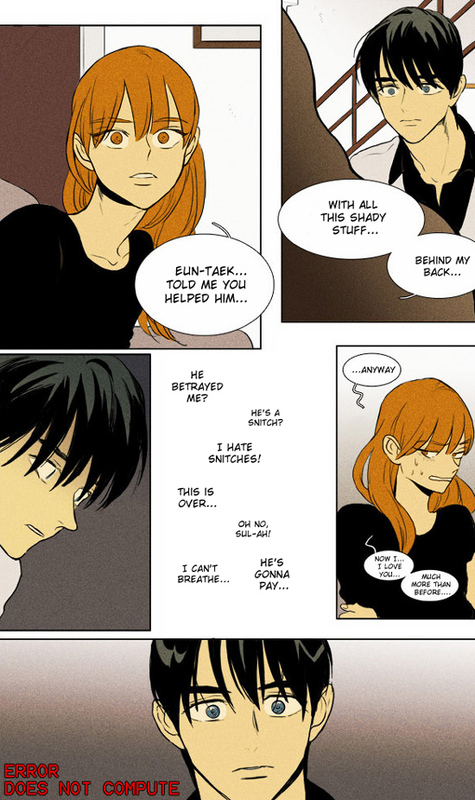 I love reading about Yoo Jung back story. @sam should have been fixed now, access http://otoon-api.bumblebits.net/overtooning.js and refresh (F5 usually), and then it should work as usual. the skit is blurry? I honestly don't know what's going and perhaps it's only you (I did as usual for the skit =< ). The image URL is https://2.bp.blogspot.com/-kegDWtfWl08/V2_LbhLXAxI/AAAAAAAABuo/cF6RT6ONDrM3s6vWaQ02ZjCEth4wiqiBwCLcB/s1600/199-euntaek-lives-another-day.jpg could you check? Please access http://otoon-api.bumblebits.net/overtooning.js and hit the refresh button on your browser, then it should work again. Thank you so much! ^^ I love backstory chapters! Just a typo I noticed: "who's opinion" should be "whose opinion"
Whenever I click the chapters in Season 3, for some reason it keeps directing me to the first chapter of Season 1 instead of the more recent ones you guys have translated. Please help!